Salt makes food taste better. But we also know salt can be really harmful. It’s estimated that half of all heart attacks and two-thirds of strokes are caused by high blood pressure (1). Cutting your salt intake will prolong your life and possibly save you from having to take powerful, expensive drugs every day with possibly undesirable side effects. Everything I’ve read indicates that salt overconsumption is a major killer. Salt increases the amount of fluid carried in your blood vessels, narrows them, and reduces their ability to carry beneficial substances to the cells (1). Your heart, kidneys, and brain are particularly susceptible to this phenomenon and the results are commonly heart attack, kidney disease, or stroke (2). 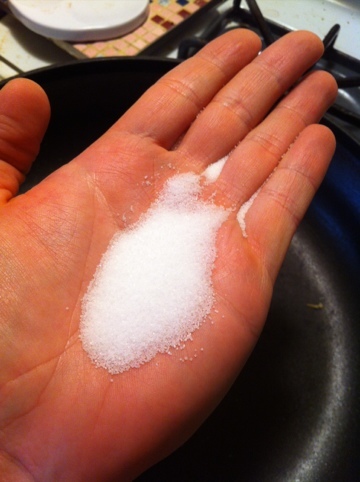 According to choosemyplate.gov, we should be consuming fewer than 2,300 mg of sodium per day. 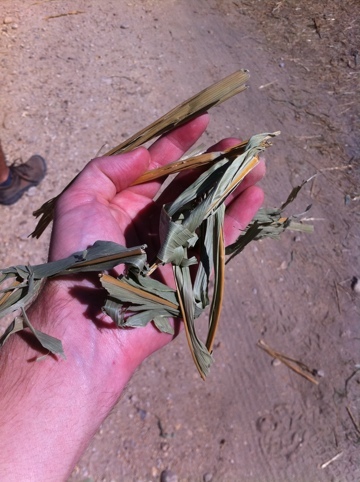 According to mayoclinic.com, this is equivalent to a teaspoon of table salt. I took a photo of a teaspoon of salt and, as you can see, it looks like a heck of a lot! There is no way I would put this much salt on my food throughout the day if I controlled the salt usage. At the very least, this amount would be adequate to season my cooking during a day. But the Center for Science in the Public Interest, a terrific nutrition information outlet whose newsletter I subscribe to (and blogged about), says that average sodium intake is around 4,000 mg per day. Wow! Keep in mind that the body only needs about 180 mg of sodium per day. You may have heard about a study that was released earlier in 2011 which reportedly minimized the danger of salt intake (3). The study has received a fair share of criticism from the Centers for Disease Control and the head of Harvard’s School of Public Health based on it’s questionable design (4, 5). Of course, the media jumped on the research report like bees on honey. The fact is that the study was flawed and should not affect your goal of moderate sodium consumption. Why is there so much salt in processed foods? 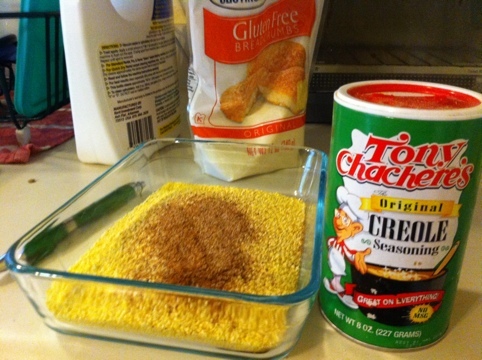 Because it makes bland, highly refined food more palatable. Salt also helps preserve processed foods – it helps the food be more stable on the shelf, where it needs to sit for days and weeks. 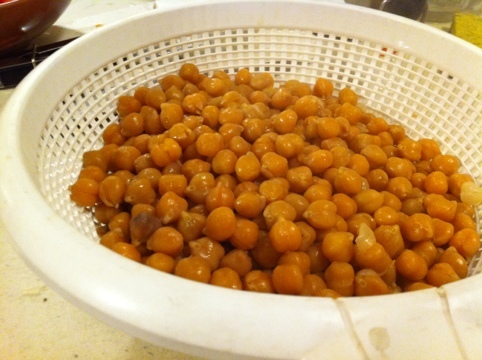 Stable food is easier to make, store and sell because it minimizes waste and so it is relatively cheap. 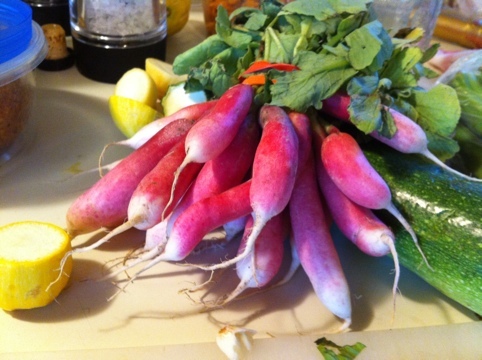 Fresh food spoils fairly quickly and is therefore less convenient. It’s also vastly, vastly more healthful. The desire for cheaper, more convenient food to accommodate our increasingly time and cash strapped lives increases the demand for this health-sapping food. The stress we experience further increases our desire for comforting foods, raising the demand further. Profit-driven corporations are more than happy to supply the object of our desire: fast, cheap calories. Cook at home more than you eat out. It’s almost impossible to stay within salt intake limits when you eat out. This is the main recommendation. When you eat out, try to go for whole, unprocessed foods. 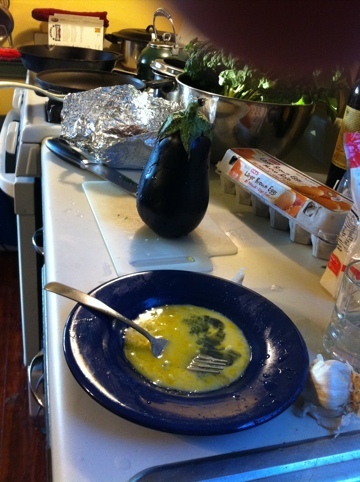 When you cook at home, be sure to actually cook and not just heat up something that was in a wrapper (e.g., a TV dinner). I love Indian cuisine. The use of spice, the use of vegetables and legumes, and the absence of overwhelming quantities of meat (if there is any at all) make me feel great when I eat Indian. So, it’s been one of the cuisines I’ve tried to learn and master, with varying degrees of success. 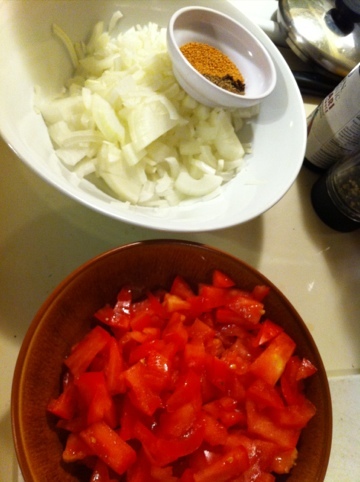 Below: The primary ingredients – tomatoes, onions, mustard seeds (the yellow round ones), cumin seeds, whole cloves and chanha masala (a spice powder). 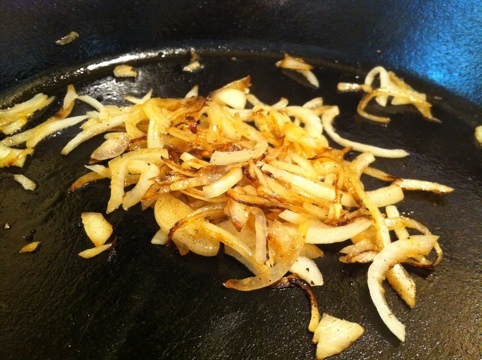 Below: Using the cast iron skillet for extra iron. 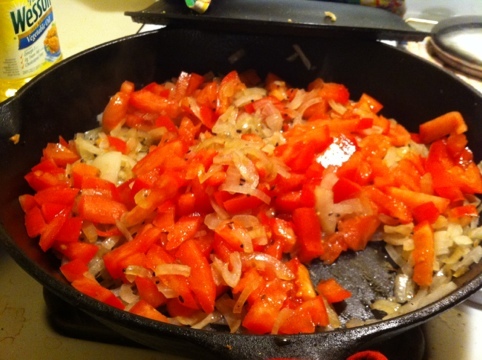 Cooking acidic foods, such as tomatoes, in cast iron really helps pull the iron out and supplement your iron intake. 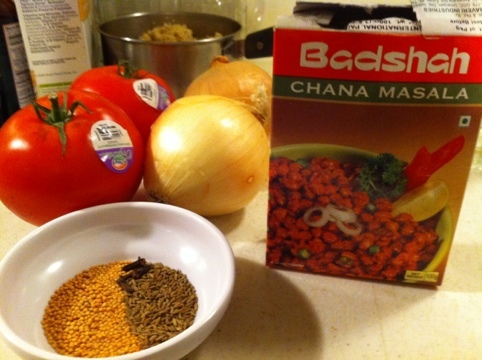 Below: The creamy result of chana masala. 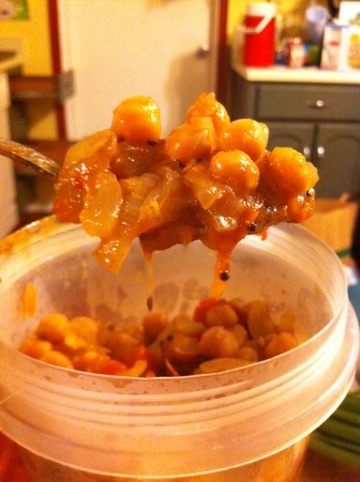 Sweetness from the onion, acidity from the tomato, texture from the chickpeas (the chana), and intense flavor from the masala (spices). Serve on warm basmati rice and enjoy good health! 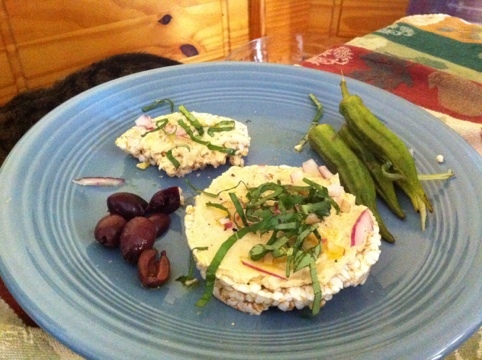 Whipped up a quick hummus-rice cake snack/lunch after a fun bike ride and before we head out to see Spring Awakening, a musical co-written by one of my favorites, Duncan Sheik. 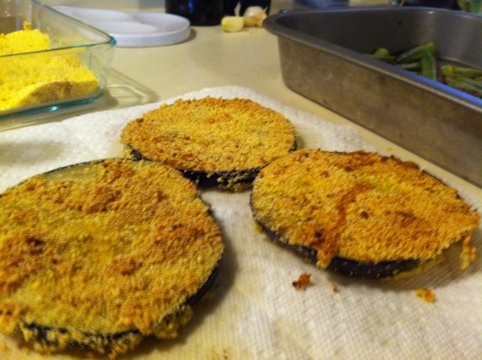 I picked up some eggplant this morning at the farmer’s market with the intent of doing this dish. It worked pretty well the first time and I liked it again. 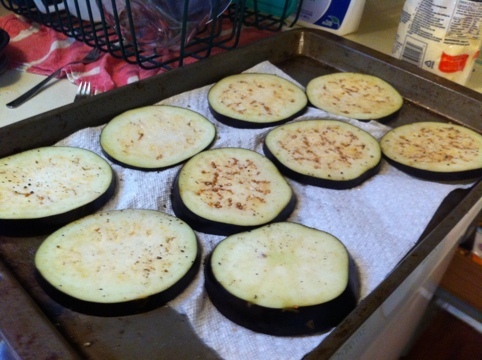 Photo Above: You’ve got to salt your eggplant slices and let them sit for a bit so they lose some of their water content. 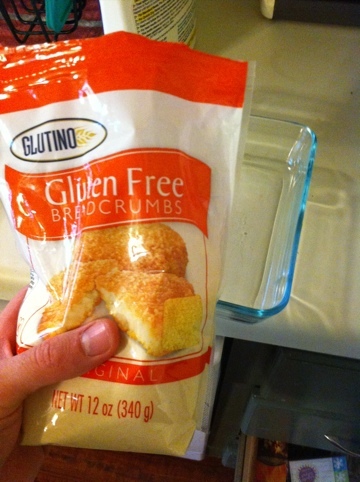 Above: These gluten-free breadcrumbs were pretty good. A bit of Tony’s helped a lot, though! 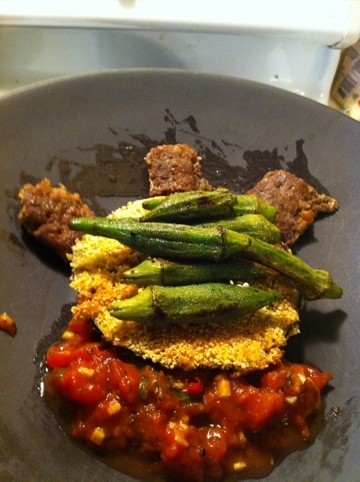 The final plate, complete with a fresh batch of roasted okra, the red sauce (canned tomatoes, fresh garlic, olive oil, salt and pepper), and a spot of Richardson Farms hot Italian sausage. Would have been perfect with a nice wine but we were lacking that. Still, it was enjoyed. 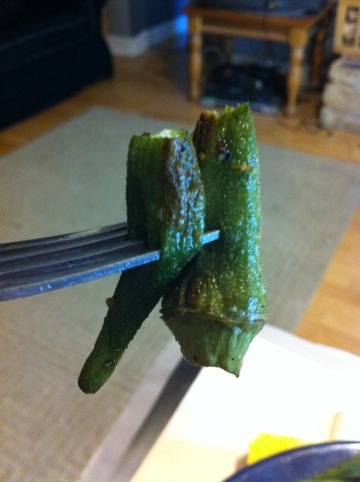 Since I had to give up gluten, I’ve craved fried okra from time to time. 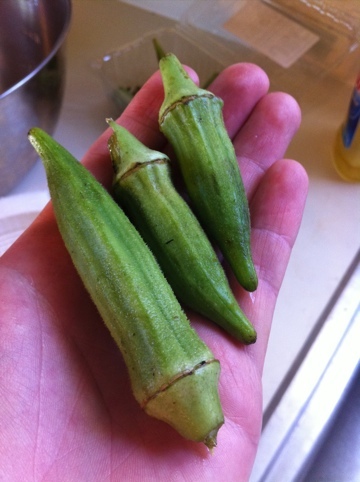 I also have heard that okra grows in plentiful quantities here in Central Texas. 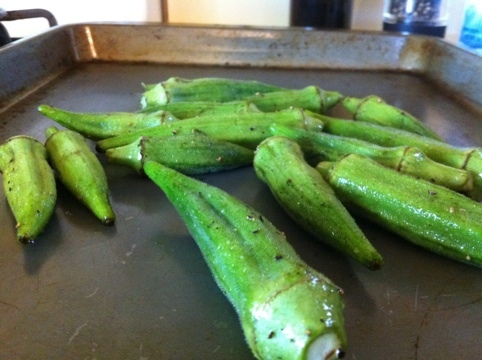 So I picked some up from Johnson’s Backyard Garden at the farmer’s market this morning. 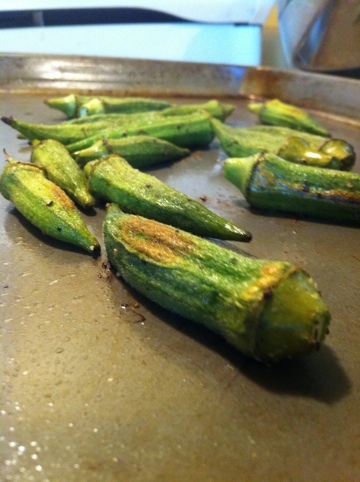 I mixed them up with a bit of olive oil, salt, and pepper, then roasted them at 425* for 15 minutes. 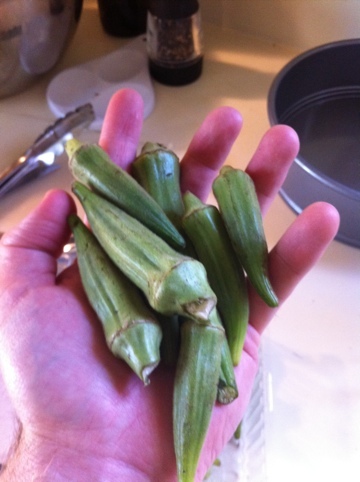 According to nutritiondata.self.com, okra is a good source of vitamin C. It contains 22% of the recommended daily allowance of vitamin C in an 80g serving. How much is 80g? It’s about a handful. The photo below measured out to 75g. 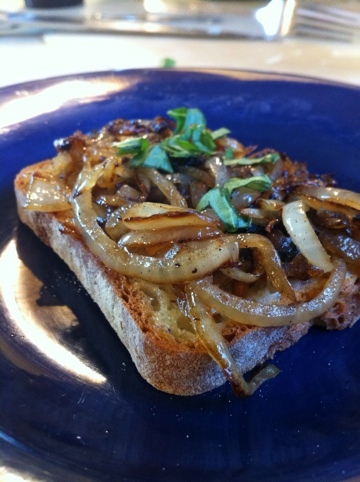 I was craving caramelized onions, so bang – I made it happen. 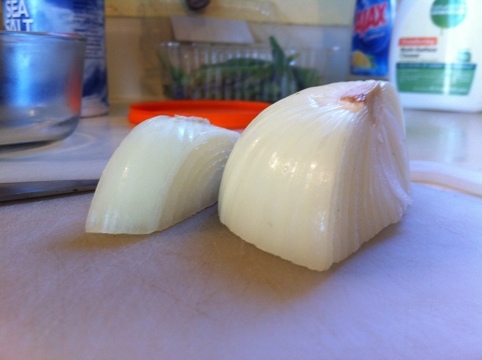 Above – My intuition was that white onion or yellow onion would be best (I don’t do this very often). 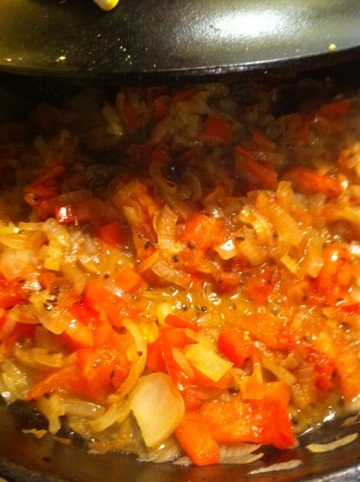 Get the onion slices going over medium heat. 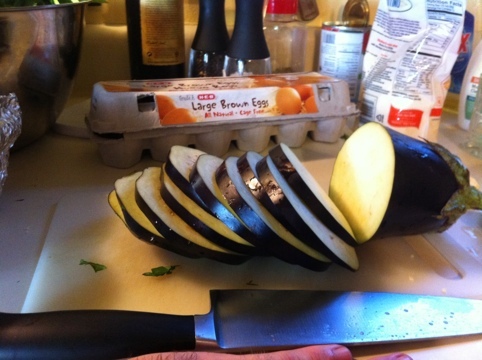 Be sure to slice them fairly thinly and add salt and pepper. 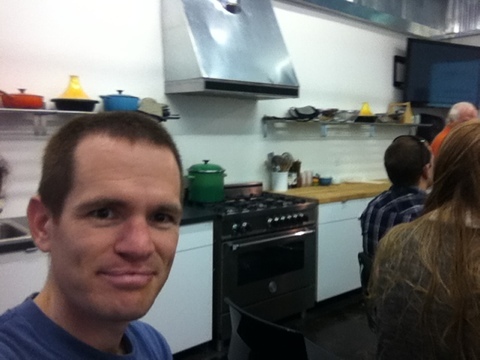 Most of the cooking happens with the cover on, but that makes it hard to take photos. 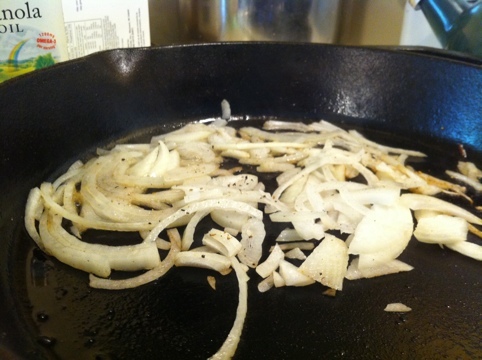 Above – The onions darkening up. The water from the onion is sweating out, the flavors are concentrating, and the sugars in the onion are becoming more prominent. 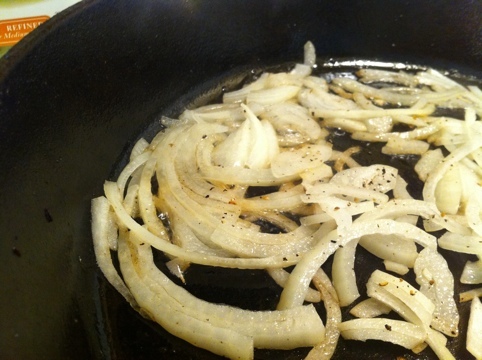 Above – The onions looking so buttery, smooth, sweet and delicious. 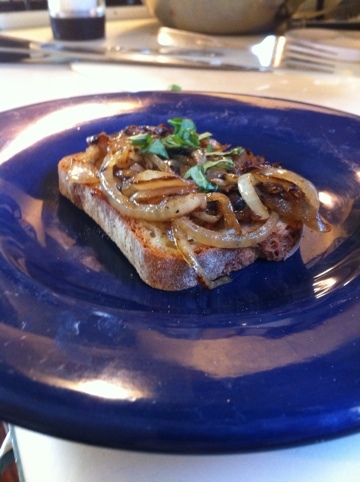 Toasted crusty bread (Udi’s gluten free – the Whole Grain variety is my favorite), caramelized onions, and a few bits of basil from Johnson’s Backyard Garden. Bon appetit! 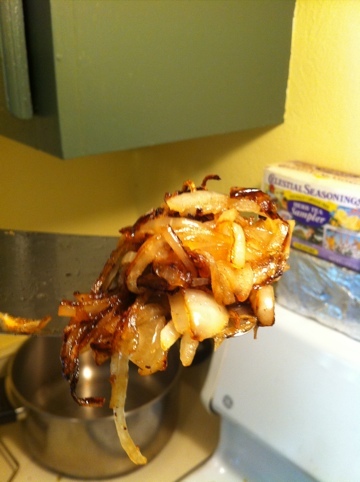 For more than you ever thought you’d want to know about caramelizing onions, check out this post on seriouseats.com. 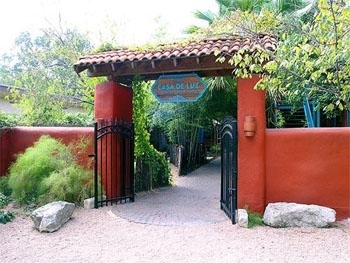 Several months ago, I had an amazing experience at a local macrobiotic restaurant, Casa De Luz, here in Austin. I had wanted to experience the vegan, macrobiotic cuisine, which I’ll admit did not sound all that appetizing from the menu description. What I experienced was plant-based food that reminded me just how delicious, nourishing, and gratifying a plant-based meal could be. 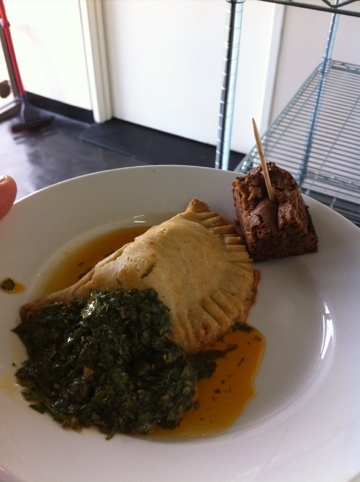 The meal was prepared with amazing care and the flavor and texture variation was beyond what I had expected. 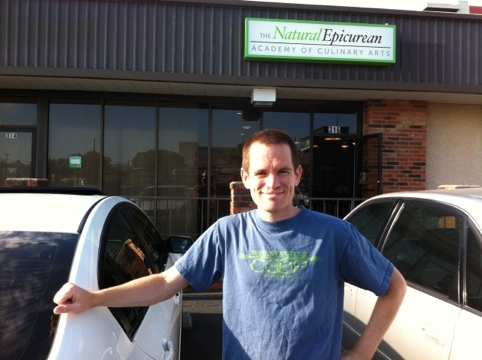 Receiving a meal that benefited me nutritionally was a happy secondary benefit. I wanted to learn more about the theory and practice of macrobiotics. 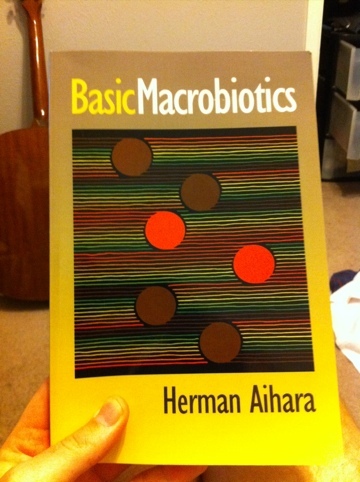 I picked up a copy of Herman Aihara’s “Basic Macrobiotics.” The book is still unfolding it’s knowledge to me – the concepts are very new to me and sometimes seem to disagree with what I believe and understand about biology. But almost everything I have read makes sense in principle and I have no doubt the practice of macrobiotics would lead one to a healthy and happy life. In macrobiotics, ideally one lives the way one wants and earns money doing what one enjoys. Not only can one save money but, at the same time, can be loved by many people and remembered even after death. Because one is happy, she or he can inspire others. Establishing such a life is a goal of macrobiotics. 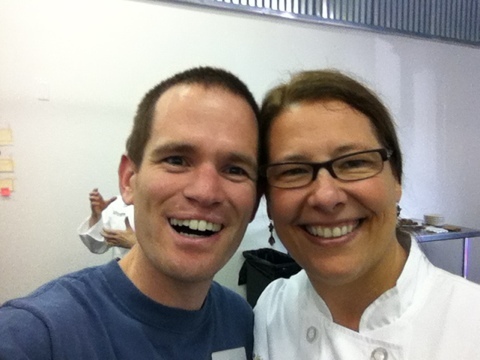 After reading Mark Bittman’s New York Times column about junk food from September 25, I investigated the local chapter of the Slow Food movement – Austin Slow Food. I found out they were going to visit Richardson Farms near Rockdale, TX, the following weekend. $20 covered the tour and a portion of locally-raised meats, so I was in. 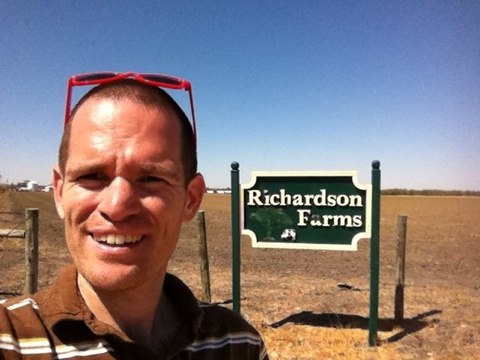 Richardson Farms is a 200 acre farm that raises cows, pigs, chickens, turkeys, and ducks…for human consumption. I went to see where meat comes from. I wanted to look in the faces of the animals that many of us eat. I wanted to see where they lived and, yes, where they die. 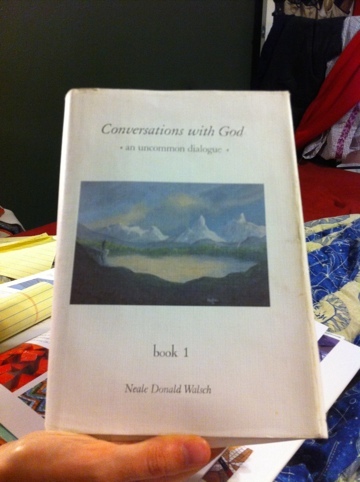 If I choose to eat meat, I want it to be with this complete knowledge. Granted, Richardson Farms raises it’s animals under conditions that I would consider more humane than your average industrial ag operation. Does that make a difference? An animal farm that is more humane is still a production facility of life destined to be killed for our food – MY food (I am what many call a “flexitarian”). I don’t have any moral judgements or philosophical certitudes to pass on, but what I can show are the images I captured. At around 90 degrees or so, it was warm, but it was a lot better than 105, which has been the high temperature range most of the summer. 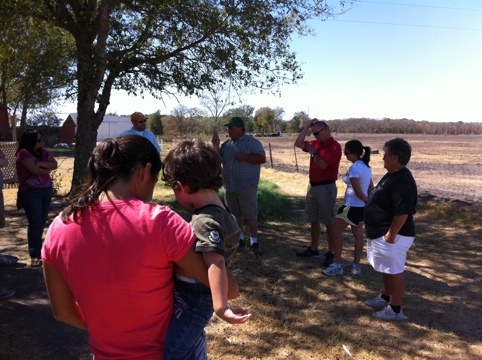 Jim Richardson (khaki shorts and baseball cap), the man who runs the farm, speaking to the Slow Food Austin group. Mr. Richardson is a veterinarian who says he loves his new career. The man knows his stuff when it comes to raising animals in a healthful, ecologically thoughtful manner. 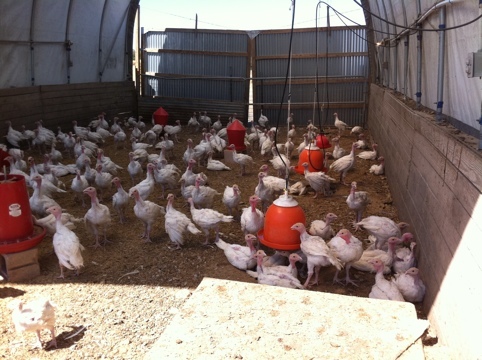 Above – Turkeys for Thanksgiving. It’s hard to read the mind of a turkey, but I can tell you it sure looks like there isn’t much going on in those brains. They gawk and honk, mouths open, most of them with their heads turned in your direction. Like photocopies of a turkey, photoshopped onto the dirt landscape in front of you. Above – Chickens. I saw one chicken sitting in the corner, seemingly unable to stand (I saw it make an attempt). I wasn’t sure what was wrong, but it did seem either hurt or sick. 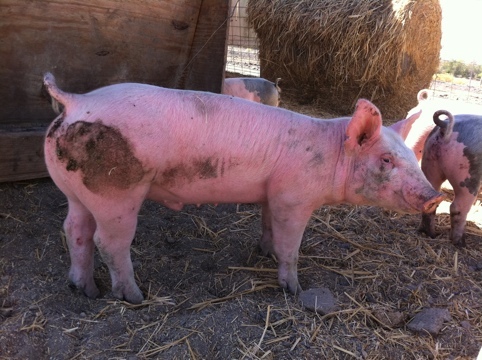 One pig kept tilting its head to one side, which they said was due to an ear infection and which they treated the pig for with antibiotics (they said the pig would not be sold for this reason). We did discuss how some animals die on the farm prior to slaughter. It seems that just like people, animals get injured or sick and some don’t make it. Still, I felt a pang of guilt for my small contribution to the confinement and eventual slaughter of animals who sometimes suffer various disabilities or injuries with/without notice from those who could correct the problem (lest we forget, many humans in our world also suffer disability and injury without notice). Is it my fault these animals are hurt? Does their pent-up animal prison condition increase the odds of injury? Am I the cause of pain for the occasional bite of chicken I enjoy? 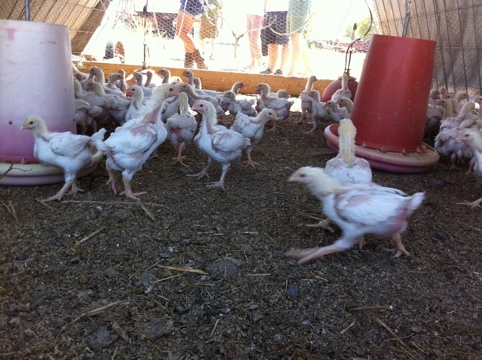 Many of the chickens were missing feathers in patches, often on their backsides. According to Mrs. Richardson, this is because they peck at each other. You put a mob of birds in fairly close quarters and things are going to happen. I didn’t see any injuries or bleeding sores, but these weren’t the robust birds, fully feathered and ready for a magazine cover photo shoot, that I had in my mind. 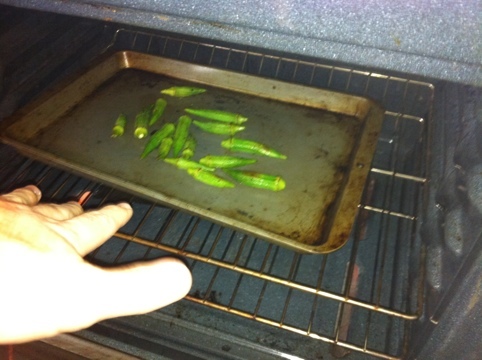 Still, I’m not sure that was a realistic image in the first place, and overall they looked healthy to me. 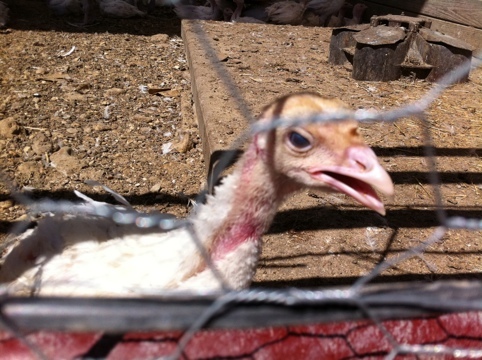 Above – A young turkey. I guess it’s fair to say that most of the birds had some part of them which was red and featherless where you’d expect feathers. Above – It’s tempting to anthropomorphize animals (imagine they are more human than they really are), such as this pig, which seems to be smiling. 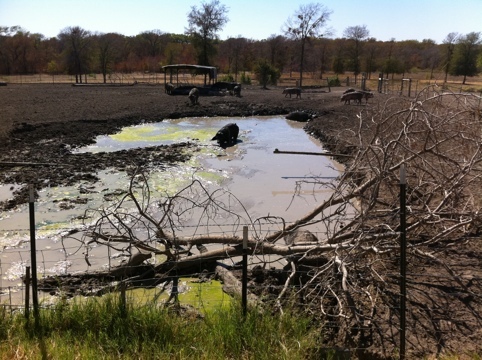 Still, the pigs had shade, and mud to roll in. On the other hand, it would someday have it’s life prematurely ended for human gastronomical enjoyment (certainly not for the nutritional benefits). 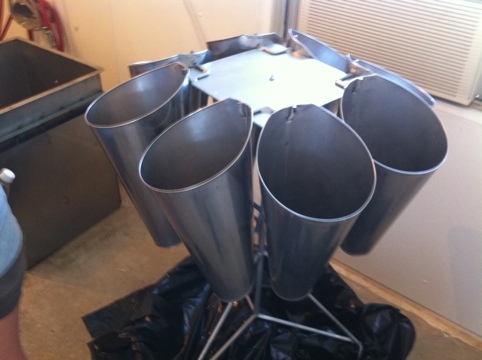 Above – A shot from the “killing room.” Chickens’ heads go into the tubes and out the bottom. This is where their throats are cut. The silver box on the left is filled with scalding water to aid in feather removal. I considered not mentioning this part, but that’s part of the problem with today’s food culture in America – we don’t think about how the meal comes to our plate. I figure it’s better to know and decide on a particular food than to make a thoughtless decision. When we think of meat as easy to get, I think we’ll be more likely to mindlessly indulge in more of it than if we were fully away of the effort and grim realities that go into it’s delivery to our dinner table. Many understandably choose to not eat meat because they find these images repugnant and unnatural, and I understand completely. 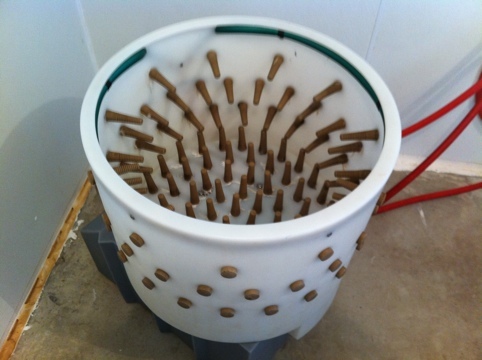 Above – This machine spins and removes the feathers of birds dipped inside (they’re dead by this point). Above – A pig wallow. Let me tell you, after a couple of hours in the dusty Central Texas heat, it looked inviting. My convenient, middle class, and Western lifestyle has meant I have the luxury of thinking animal farming and slaughter is a bit brutish. It’s not necessarily so for all the world’s people, who may raise or hunt animals for necessary food without a twinge of moral confusion. For we Americanos not wanting to bloody our Banana Republic slacks, Richardson Farms falls somewhere on the sunshine-y side of the continuum of livestock operations which starts at bucolic, idyllic pastures where you’d almost imagine the animals are happy to be your meal and goes to behemoth, frightening flesh mills. The Richardsons seem to be genuine people who care about the animals, the ecosystem, and their customers. Does anyone deserve judgment for enjoying a meal of their choosing? Aren’t they doing just what they’ve learned? Is the morality of animal consumption relative – or absolute? My research into correct diets leads me to believe that minimizing our consumption of animals is in our best interest. Beyond that, it’s up to each person to decide if, and how much, they should consume them. 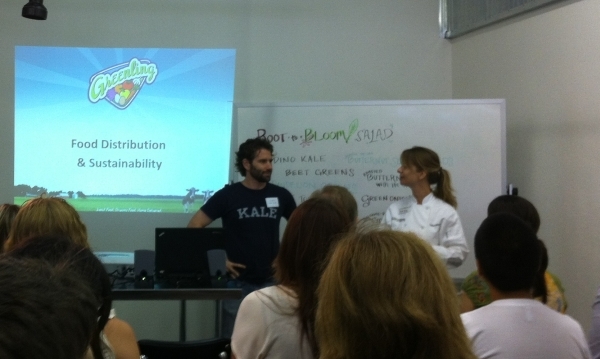 In any case, it behooves us to know from where our food comes and make choices which align with our personal values. 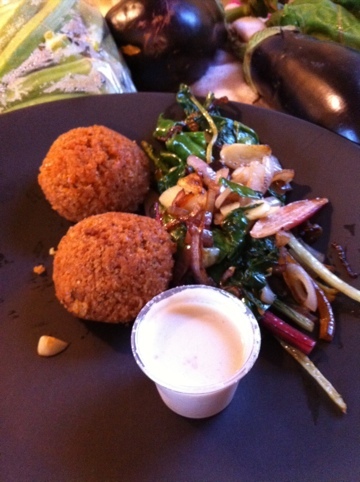 I picked up some wheat-free falafel balls at the farmer’s market yesterday. 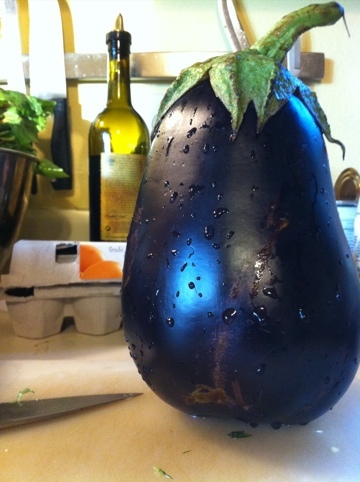 I love The Mediterranean Chef! Their hummus is my favorite in Austin. 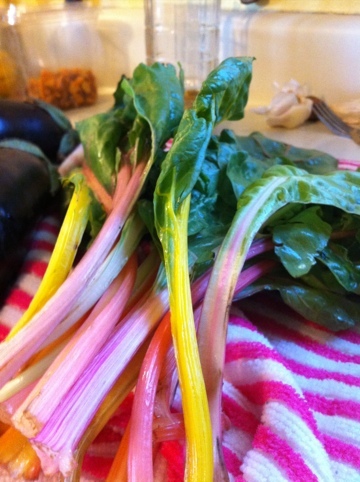 I chopped off the stems of my rainbow chard, sautéed them in olive oil with some onion and a split “breakfast radish”. 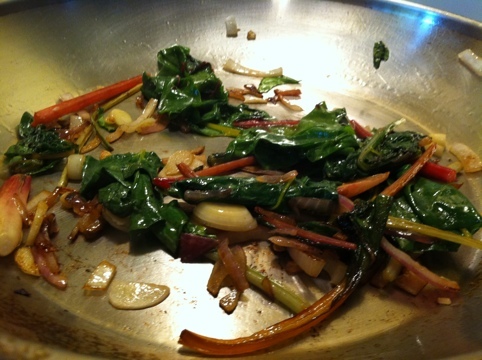 I added the chard leaves after a couple of minutes. 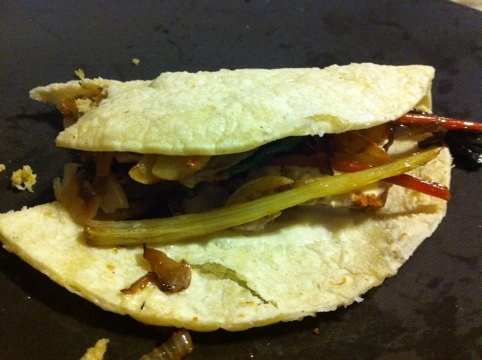 Not knowing what to do next, I had the idea to make tacos from the falafel, the chard, and tortillas from El Milagro. The tortillas needed a quick steam to soften up. YOU get to determine what you become. There is no such thing as a pre-defined “you”. YOU define that. And it can change over time. The career path is unclear. The career path – whatever it becomes – will be nearly 100% new to me. The career path likely leads to changes in my life (schedule, income level/stability, etc.). Leaving my current job means I leave my employer in a difficult place with a major, long-range project. 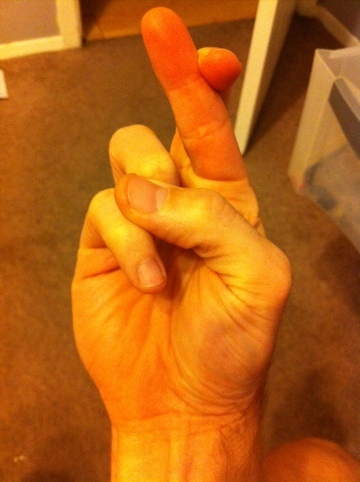 All that being said, I think it’s time for me to take the final step and notify my employer of my decision to leave. I’ll be giving 4.5 months notice, which is fair given the circumstances, I think. Tighten your seatbelts because it’s going to be a bumpy ride.